This section describes the global Use Case of EOxServer including concrete usage scenarios as examples. Figure: “Parties involved in the EOxServer Global Use Case” introduces the involved parties in this global Use Case. On the one side there is a provider of Earth Observation (EO) data. The provider has a possibly huge, in terms of storage size, archive of EO data and wants to provide this data to users. Of course the data provision has to follow certain constraints and requirements like technical, managerial, or security frame conditions but in general the provider wants to reach as many users as possible with minimal efforts. On the other side there is a user of EO data. The user has the need of certain EO data as input to some processing which varies from simple viewing to complex data analysis and generation of derived data. The user wants to obtain the needed EO data as easily as possible which includes finding the right data from the right provider at the right time at the right location and retrieving it in the right representation e.g. format. Already from this simple constellation the need for standardized interfaces is evident. Thus EOxServer implements the open publicly available interface standards defined by the Open Geospatial Consortium (OGC). In particular EOxServer contains an implementation of the Web Coverage Service (WCS) including its Earth Observation Application Profile (EO-WCS) and the Web Map Service (WMS) again including its EO extension (EO-WMS). These interface standards have been chosen to support the new paradigm of “zooming to the data”. This means looking at previews of the data rather than searching in a catalogue in order to find the right data. WMS together with its EO extension is used for the previews whereas WCS with its EO extensions is used to download the previously viewed data and metadata. Of course a provider is free to operate a catalogue in parallel including references to the EO-WMS and EO-WCS. 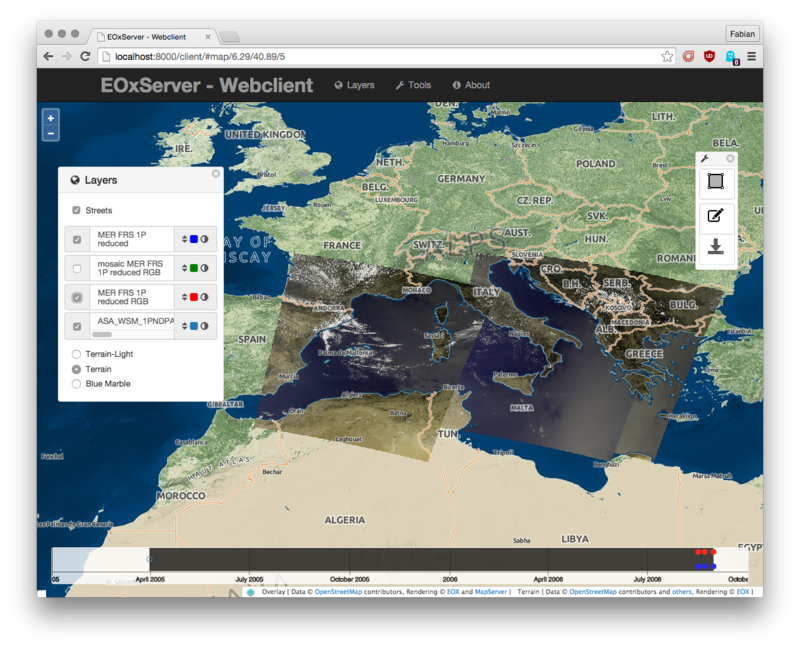 The EOxServer software stack is a collection of Open Source Software designed to enhance a wide range of legacy systems of EO data archives with controlled Web-based access (“online data access”) with minimal efforts for the provider. The user not only significantly benefits from the provider’s enhanced online data access but also from the client functionalities included in the EOxServer software stack. These features result in the general benefit for the provider to be more attractive to the user. The following sub-sections provide details from the provider and user point of view highlighting the possible usage of the EOxServer software stack. The provider operates an archive of EO data with different ways of actually accessing the data. For simplicity let’s assume the data archived in this legacy system can be accessed in two ways. First there is the local access directly to the file system via operating system capabilities. Second there is an online access by exposing certain directories via FTP. Figure: “Provider View” provides an overview of the provider environment showing the provider’s legacy system and the extending EOxServer software stack. The recommended way for the installation of the EOxServer software stack is to use a host which has direct read access to the data via the file system using operating system capabilities. If this file system is physically located on the same hardware host or if it is mounted from some remote storage e.g. via NFS or Samba doesn’t matter in terms of functionality. However, in terms of performance the actual configuration has some impact as big data might have to be transferred over the network with different bandwidths. The other option is to use the read access via FTP which is a practical configuration in terms of functionality. However, in terms of performance this isn’t the recommended configuration because of the need to always transfer whole files even if only a subset is needed. Various caching strategies will significantly improve this configuration, though. Figure: “Activities to Enhance the Provider’s Environment” shows these activities needed to enhance the provider’s environment with online data access to the EO data archive legacy system. The EOxServer software stack consists of the EOxServer, the Identity Management, and the Applications Interface software components. The Identity Management layer is an optional layer on top of EOxServer. Thus and because its configuration is extensively discussed in section Identity Management System we skip it here. The Applications Interface software components are discussed in detail in section The General User View below. As EOxServer is based on Python, MapServer, GDAL/OGR, and Django these software components need to be installed first. The base configuration of EOxServer consists of the generation of an EOxServer instance and registering it in a web server. The EOxServer instance generation includes the configuration of various parameters like database name, type, and connection info, instance id, paths to logfiles, temporary directories, etc. as well as the initialization of its database. There are two options for the database management system (DBMS). The first is SQLite together with SpatialLite which is a single file DBMS and thus best suited for testing purposes. The second is PostgreSQL together with PostGIS which is a full fledged DBMS with numerous management functionalities and thus best suited for operational environments. The database itself holds the configuration of components and resources (e.g. is WCS 1.0.0 enabled) as well as the coverage metadata ingested during registration (see section Data Registration). EOxServer can be operated with any web server that supports the Python WSGI standards. For testing and implementation purposes the Django framework directly provides a simple web server. However, in operational environments the recommended deployment of EOxServer is to use the well-known Apache web server together with mod_wsgi. In most cases it will be the easiest, fastest, and most stable deployment choice. At this point the provider’s administrator or operator can actually run the software stack and configure the remainder via EOxServer’s admin app. This app is accessed via a standard web browser and, when using Django’s internal web server, available at the URL: “http://localhost:8000/admin”. Use the user credentials that have been set in the database initialization step. Figure: “Admin app - Start” shows the admin app after successful login. On the left side the four modules “Auth”, “Backends”, “Core”, and “Coverages” are shown. “Auth” is the internal Django user management module which is at the moment only used for the admin app itself. “Backends” and “Coverages” are the modules for data registration which is described in section Data Registration below. The “Core” module is used to enable or disable EOxServer components like services. The provider can decide which services and even which versions of which services EOxServer shall expose. A possible configuration is to expose WCS 2.0 and WMS 1.3.0 which are the latest versions but not any older version. In the default database initialization all services are enabled. The data registration is done via the functionalities provided by the “Backends” and “Coverages” modules of the admin app. Figure: “Admin app - Start” shows for which data types, or models in Django terminology, instances can be added or changed in these modules. These data types correspond to tables in the database. Only a subset of the full data model (see Figure: “EOxServer Data Model for Coverage Resources)” is shown in the admin app because some are filled automatically upon saving and some are included in the available ones like TileIndex in Stitched Mosaics. The Dataset Series provides a convenient way to register a complete dataset series or collection at once. Figure: “Admin app - Add/Change Dataset Series” shows the admin app when changing a Dataset Series instance. The operator has to provide an “EO ID” and an “EO Metadata Entry”. All other parameters are optional as can be seen by the usage of normal instead of bold face text. However, in order to actually register coverages either one or multiple “Data sources”, consisting of a “Location” e.g. a data directory and a “Search pattern”, have to be added. Alternatively, the administrator can decide to register single coverages and link them to the Dataset Series via the “Advanced coverage handling” module (see Figure: “Admin app - Add/Change Dataset Series Advanced”). Figure: “Admin app - Add/Change EO Meatadata” shows the screen for adding or changing an EO metadata entry. The operator has to provide the “Begin of acquisition”, “End of acquisition”, and “Footprint” of the overall Dataset Series in the same way as for any EO Coverage. Calendar, clock, and map widgets are provided to ease the provision of these parameters. Optionally a full EO O&M metadata record can be supplied. Saving a Dataset Series triggers a synchronization process. This process scans the Locations, e.g. directories and included sub-directories, of all configured Data Sources for files that follow the configured search pattern e.g. “*.tif”. All files found are evaluated using GDAL and for any valid and readable raster file a Dataset instance is generated in the database holding all metadata including EO metadata for the raster file. Of course the raster file itself remains unchanged in the file system. Let’s look in more detail at the synchronization process and assume a plain GeoTIFF file with name “demo.tif” was found. The synchronization process extracts the necessary geographic metadata i.e. the domainSet or extent consisting of CRS, size, and bounding box directly from the GeoTIFF file. Where does the metadata come from? In order to retrieve the EO metadata at the moment the process looks for a file called “demo.xml” accompanying the GeoTIFF file. In future this may be expanded to automatically retrieve the metadata from catalogues like the ones the EOLI-SA connects to but for the moment the files have to be generated before the registration. The content of this file can either be a complete EO-O&M metadata record or a simple native metadata record containing only the mandatory parameters which are: “EOID”, “Begin of acquisition”, “End of acquisition”, and “Footprint”. If no “demo.xml” is found the process uses default values which are: file name without extension, current date and time, and full bounding box of raster file. Of course, the synchronization process can be re-run at any time e.g. from a daily, hourly, etc. cronjob. This configuration is sufficient to bring online a complete EO data archive accessible via the file system. A comparable synchronization process is available for FTP and rasdaman back-ends as well as for Stitched Mosaics. However, mostly these processes require more complex synchronization steps. For example, via the FTP back-end it is better to not inspect the raster files itself which would mean to completely transfer them but to retrieve the geographic information together with the EO metadata. Please refer to the remainder of this Users’ Guide for detailed information and usage instructions. The user needs certain EO data as input to some processing. This processing ranges from simply viewing certain parameters of EO data to complex data analysis and generation of derived data. The user has an environment with the software installed needed for the processing. For simplicity let’s assume the user has two different software tools installed to process the data. First there is a standard web browser which manages the HTTP protocol and is capable of viewing HTML web pages. Second there is a GIS software which shall be QGis in our example. Figure: “User View” shows the user environment and its installed software. First of all the user needs to find an EO data provider who has data that fit the user’s purpose and who offers the data via a mechanism the user can handle. Luckily the user happens to know a provider who is running the EOxServer software stack on an EO data archive holding the required data. Thus the user can decide between several ways how to retrieve the data. Some involve client side components of the EOxServer software stack but because of the strict adherence to open standards various other ways are possible in parallel. However, we’ll focus below on two ways involving EOxServer software components. Figure: “Browser app featuring EOxServer’s Web API” shows a screen shot of this app. The app implements the paradigm of “zooming to the data” i.e. the user directly looks at previews of the data served via EO-WMS rather than having to search in a catalogue first. After zooming to and therewith setting the Area of Interest (AoI) and setting the Time of Interest (ToI) the user following the download button is presented with the metadata of the included datasets retrieved from the offered EO-WCS. The metadata includes grid, bands, CRS, nil values, etc. of the datasets but also formats, CRSs, and interpolation methods the dataset can be retrieved in. Based on this information the user decides which datasets to download and specifies parameters of the download like spatial sub-setting, band sub-setting, CRS, size/resolution, interpolation method, format, and format specific parameters like compression. The app guides the user to specify all these parameters and downloads only the really needed data to the user’s environment. The EO-WCS protocol is used by the app transparently to the user i.e. most of the complexity of the EO-WCS protocol is hidden. This app shows the benefit of the integrated usage of EO-WMS and EO-WCS for the online data access to the EO data archive. The Webclient Interface section of the documentation provides more details about the Web API. Note, that the Python Client API is not yet implemented and only available as concept. In the second case the user wants to use the full-fledged GIS software tool QGis and thus decides to use the handy EO-WCS plug-in provided by the provider. This plug-in makes extensive use of EOxServer’s Python Client API. Figure: “QGis EO-WCS Plug-in featuring EOxServer’s Python Client API” shows a screen shot how the usage of the EO-WCS plug-in for QGis might look like. The user first has to connect to the provider’s EO-WCS endpoint. Once connected the plug-in retrieves the metadata about the available dataset series and shows them as a list to the user together with the tools to specify AoI and ToI. Metadata of datasets and stitched mosaics might also be retrieved in this step if the provider configured some to be directly visible in the capabilities of the EO-WCS. The selected dataset series are transparently searched within the set spatio-temporal bounding box and available datasets and stitched mosaics presented to the user. After exploring and setting the download parameters like in the first case the EO-WCS plug-in downloads again only the required data sub-sets. In addition to the previous case the EO-WCS plug-in applies various strategies to limit the data download. For example if a dataset is added to the current list of layers only the currently viewed area needs to be filled with data at the resolution of the screen. In addition the data can be sub-setted to one or three bands that are shown i.e. there’s no need to download numerous float32 bands just to preview the data. With using the EOxServer software stack on the provider side the plug-in includes the possibility to exploit the integrated usage of EO-WMS and EO-WCS. This exploitation includes the displaying of previews in the two steps described above. Another feature is, that the possibly nicer looking images are retrieved from the performance optimized EO-WMS to fill the current view. Once the user starts some sophisticated processing the plug-in retrieves the required sub-sets of the original data. Again strategies to limit the data download are applied.